Did you know . . . a new ice restaurant welcomed its first diners at this year's Harbin Ice and Snow Festival. 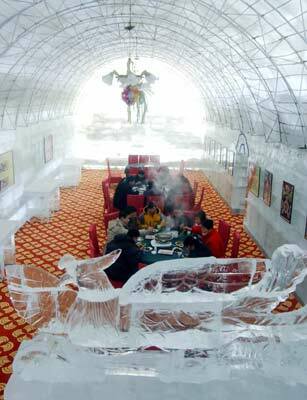 The restaurant, made entirely out of ice with ice walls, an ice dome and ice table and chairs can hold up to 100 guests. Various ice sculputres will also be on display in the restaurant. Popular local cuisine will be served. Not surprisingly, the most popular dish is the "huoguo" which is the traditional hot pot meal. To prevent the ice from melting, two ventilation outlets in the roof of the restaurant ensure the internal temperature remains at least at freezing level although the temperature inside is usually at 14 degrees Farenheit. For the comfort of guests, the floor (made entirely out of ice) is laid with thick carpet and ice furniture are covered with wool padding to allow patrons to sit comfortably. Firstly, our very best wishes to each of you for the New Year and our personal hopes and prayers for all of our good works this year. Hope you all had a wonderful and enjoyable holiday season. What intrigues me about South America is the apparent rise of left-wing leaders and social policies. Granted, this is not akin to the Communist era of Fidel Castro, but it is significant. Apart from tall the political rhetoric, I think there is a very interesting impact on China. Already an enormous magnet for American investment, China is likely to be a major benefactor in the political shift in South America. First, the new administrations are more likely to strengthen ties to America�s former adversary, now competitor and critical trade partner. China can be more global, and build influence in the western hemisphere as it builds customers and joint ventures. More significantly, American foreign investor types are (and should be) likely to look to China as a lower risk investment, especially for investments with high labor issues. Uncertainty repels investment. The less expensive labor markets of South America could well be trumped by new national policies unfriendly to business. It may be arguable as to the extent of the problem, but clearly South America will lose some competitive standing for U.S. investment dollars with each notch to the left. For those who read this regularly, you know I am concerned that U.S. business interests and investors are losing out in the biggest game in town. Perhaps the political climate in South America will prod some Americans to get into the game in China. That is my New Year�s wish and resolution. Rural elementary and secondary schools will get the bulk of educational funds allowing children to enjoy new computer and multimedia classrooms and free education as early as 2010, according to the Ministry of Education (MOE). "Rural education is still the weakest link, and our newly-allocated educational funds will be used mainly in rural areas," said Zhang Xinsheng, vice-minister of MOE. As many as 36 million rural students are currently benefiting from this policy. They will be exempted from paying miscellaneous as well as tuition fees by 2010. Zhang said China aims to increase the percentage of educational input in gross domestic product from 3.41 percent in 2003 to 4 percent in the future. This new program aims to solve the educational gap, whereby 8 percent of the country has not yet completed nine-years of education in the poorer western part of China. Northeast China's Heilongjiang province is expected to see a record harvest year in grain production, with the total grain outputs to hit 79 billion pounds this year, an increase of 14.8 percent to the previous year, according to sources with the provincial government. Since 2004, a series of preferential policies on supporting grain production have been issued. Farmers in the province were exempted from agriculture taxes and were given grain subsidies. To promote grain production and help farmers earn more money from grain planting, the province of Heilongjiang has invested USD 32.5 million in modernizing farm equipment. European aircraft manufacturer Airbus could shift the final assembly line for some of its aircraft outside Europe for the first time under an industrial pact signed with China on Sunday, company officials said. A feasibility study will establish within six months whether it would make sense to build an alternative assembly point for A320 single-aisle aircraft in China, the company said. Chinese demand for aircraft is expanding rapidly, helping to propel Airbus and its US rival Boeing towards a record year for orders in 2005 despite a severe downturn of the aviation industry in the U.S.
Canada's McCain Foods Ltd. has learned one clear lesson from the two-week shutdown of its new French fry factory in Harbin, China: It has to start digging a well. The plant should restart early this week, said Basil Hargrove, McCain's chief executive officer for Asia, who is coping with fallout from an industrial accident that sent toxins spilling into the river from which Harbin derives its water supply. McCain, the world's largest producer of French fries, had just opened its plant in late October, ending six years of crop trials and false starts in searching for a suitable factory location. Mr. Hargrove said the incident has not lessened McCain's enthusiasm for its Chinese factory. He sees it as part of the learning curve in a long- term venture aimed at seizing a bigger share of the rapidly growing fast-food market in China. Since Walmart's entry into China in 1996, the retail supergiant has opened 40 stores in various stores. Latest expansion include the construction of a 200,000 square feet store in the city of Hangzhou in Zhejiang province. In other news, domestic Chinese retail giant Dashang Group Co Ltd yesterday merged with Harbin No 1 Department Store, one of the largest department stores in the country. Dashang will refurnish the entire store, changing it into a new shopping facility, which integrates shopping and entertainment. This marks the beginning of Dashang's further expansion in the Northeastern retail market. With the liberalization of the Chinese economy, the rate of disposable income has increased tremendously which drives the booming retail industry.